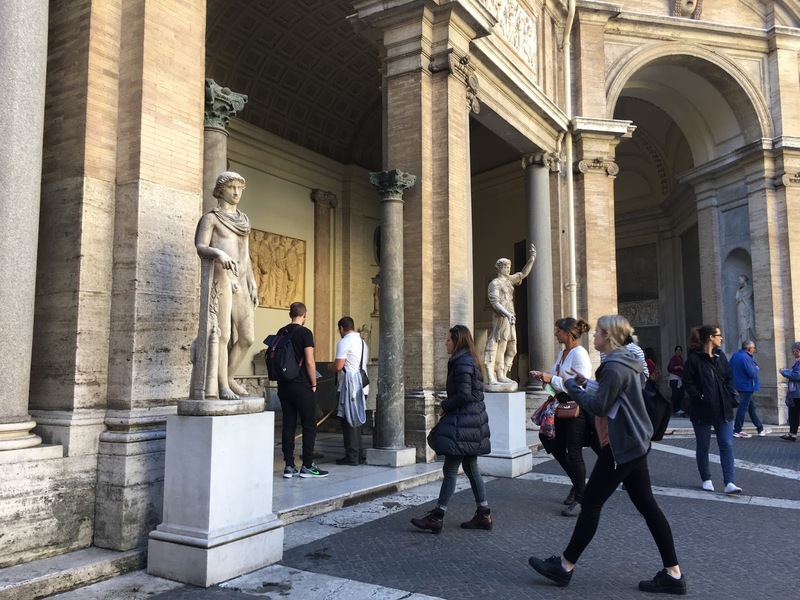 It was our last day in Rome but also our last day in Italy and I had mixed feelings. It had been an incredible week of exploring and sightseeing, but I was also tired and wanted to go home. Being five months pregnant was starting to take its toll although I held up really well during the trip. 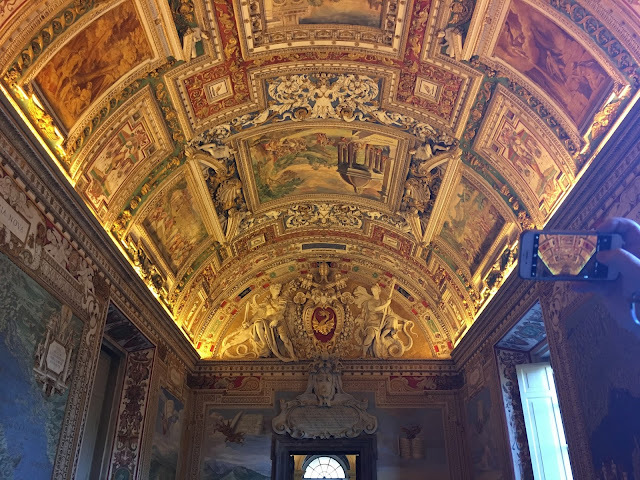 I had pre-booked tickets to the Vatican City for our last day and we were excited to see what all the hype was about. 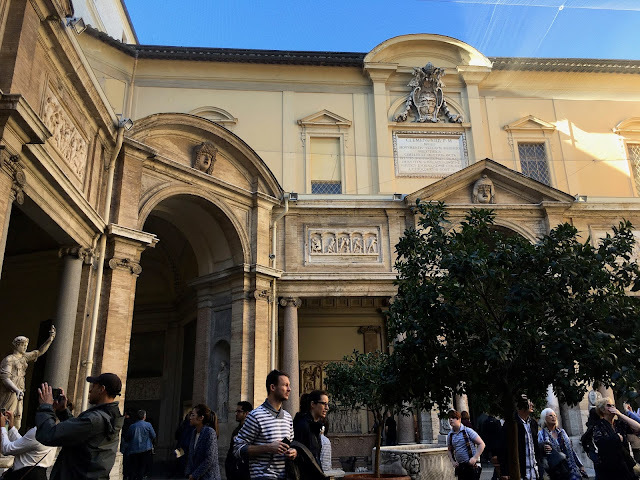 It also happened that our guesthouse was super close to the Vatican, but what I hadn't taken into account was that the entrance to the Vatican was on the north, not the south where our guesthouse was. We had to walk halfway around the Vatican and most of it was uphill. I was huffing and puffing by the time we got to the entrance. The fact that we had pre-booked our visit helped and we didn't have to stand in line (luckily we were there quite early so there wasn't really a line to begin with, only if you were part of a tour group). We did our security checks and then tried to figure out where to start and how to proceed. I took my boss's advice (he had been there a year ago) and immediately went to the Sistine Chapel - basically the reason I wanted to go to the Vatican. 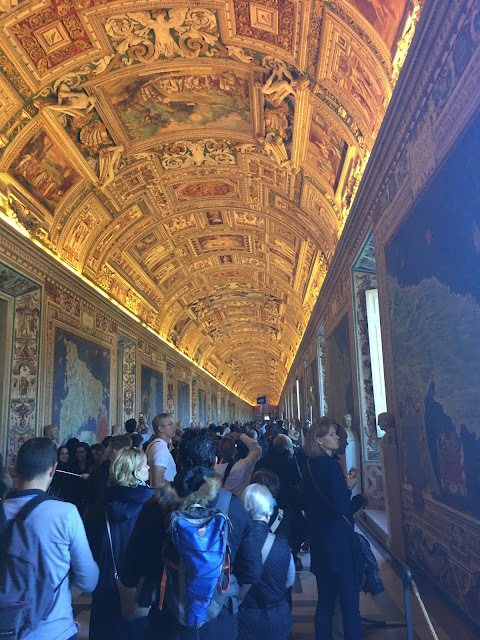 There were a lot of people who walked up the stairs to the Sistine Chapel and we weren't allowed to take photos nor speak in anything louder than a whisper. There were guards who would shout, "No pictures, please!" and "Silenzio!" every few minutes, which was quite annoying. I also don't understand why you couldn't take photos of the ceiling, I mean, it's not like you can get up close and personal to it. The famous ceiling, painted by Michelangelo as a young man, was truly spectacular, but the chapel (more like a large room) was quite average. The ceiling depicted different stories and scenarios, the most famous being The Creation of Adam (the one where Adam and God's outreached arms touch at the fingertips). It was smaller than I thought it was going to be, but it was very cool to see. 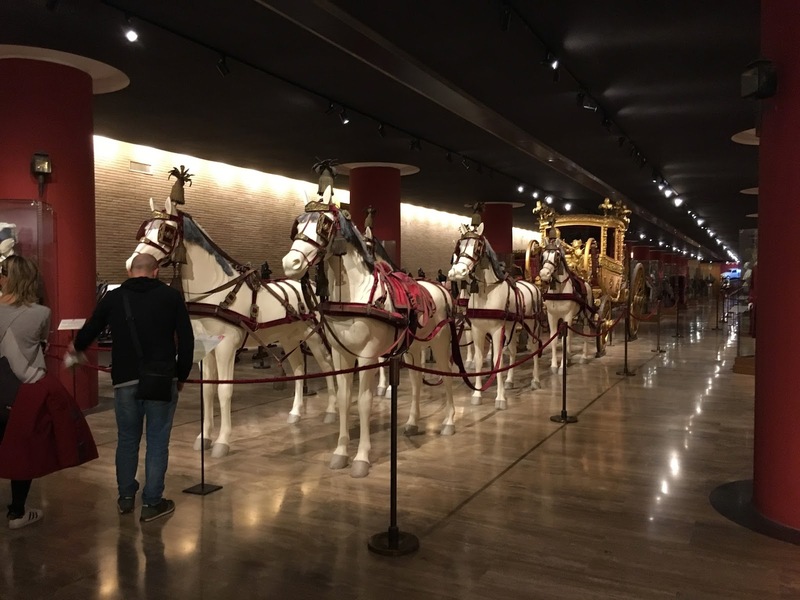 There are different museums and each hall showcases a different era or set of artworks. There is, for example, a Greek exhibition and an Egyptian exhibition. At first I thought all the Egyptian references was weird, until I realised how close Italy and Egypt actually are! They refer to Egypt as the "nearby East" which, to me, is hilarious. We saw some exquisite ceilings and some pretty statues and paintings, but to be honest, it didn't blow my socks off. 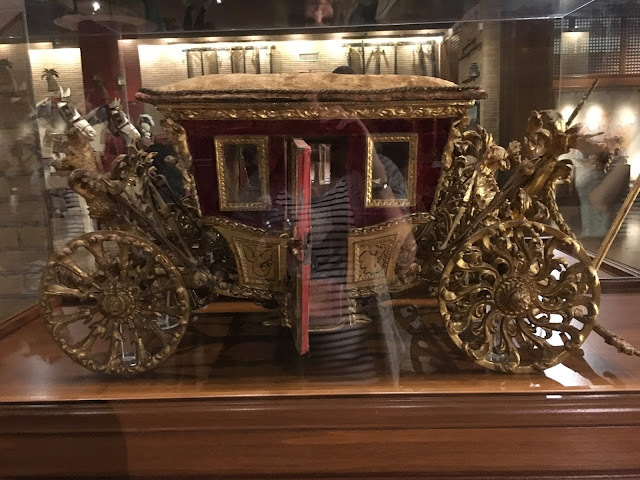 I felt that we saw more amazing things in the Galleria Borghese and the Uffizi Gallery (you can read about them here and here), amongst others. It might be that we were just tired and "over it", or that we have been spoiled by so many amazing sights, I don't know. 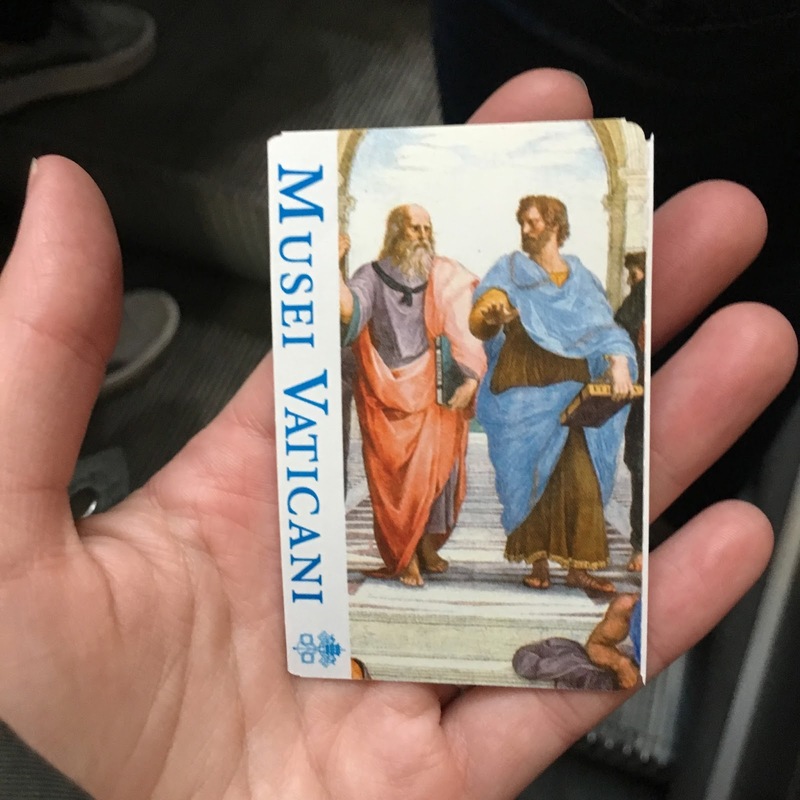 We ended up not spending as much time in the Vatican as we planned, mainly because the map we got of the Vatican was extremely confusing (it actually didn't make any sense at all) and there were a lot of people and they were mostly very, very rude. We went to the automobile museum which houses all the previous Popes' carriages and, more recently, the Popes' fancy cars (what is nowadays referred to as the "Pope Mobile"). 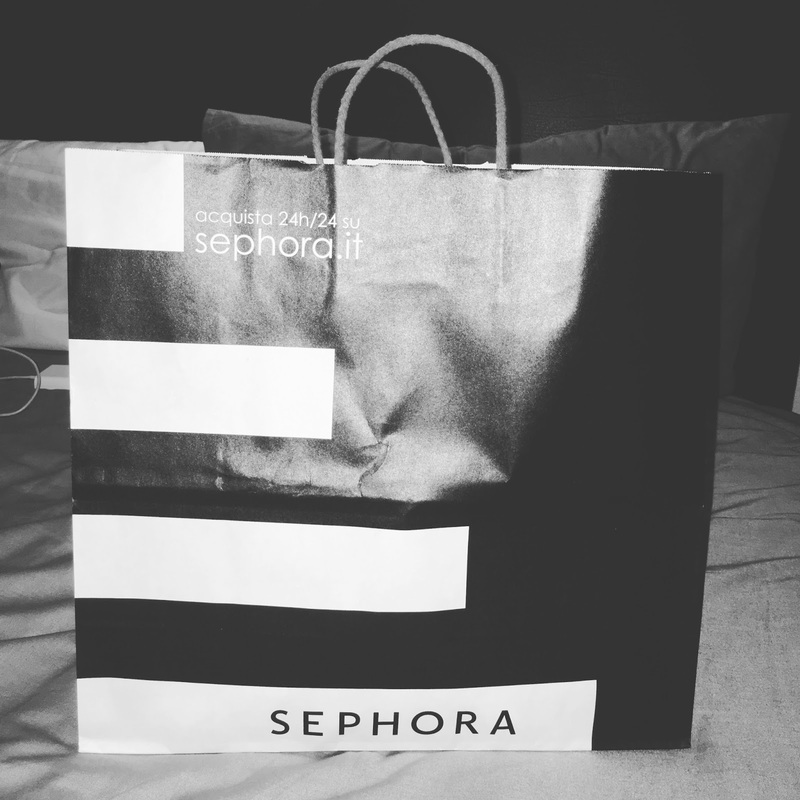 We also wanted to go to St. Peter's Basilica but decided to skip that in favour of going to Sephora. I initially wanted to go the previous day but we ran out of time with first the water taxi strike and then the long bus routes to our guesthouse. This had almost disastrous consequences as the large Sephora that I wanted to go to was quite a distance from the Vatican so we had to take two different busses to get there. I had about 45 minutes to do my shopping (I think I might have missed an entire floor in my hurry, but oh well) and then we had to catch busses back to our guesthouse to collect our bags. We waited and waited and waited for the first bus and when it didn't arrive we started walking to another stop to find another bus. Everything seemed to be running late and by that time I wanted to pull my hair out of my head from frustration. Eventually we made it to the guesthouse and then had to walk to the nearby train station. I thought that we could take a train from that train station and get to the airport in half an hour (like we did when we initially went to Rome from the airport). But the San Pietro train station does not offer express shuttles plus we had to change trains halfway. By now my anxiety levels were flaring up. We had trouble figuring out where to board the train and then we received conflicting advice regarding which train to actually board: the lady at the ticket office said we should board the train on platform 2 but the internet as well as three very kind gentlemen on the platforms told us no, we should take the train on platform 3. With mere hours to spare before our flight home we were desperately hoping we had the right answer. We decided to go with platform 3 and thankfully that turned out to be the correct train. By then I was extremely close to crying as we were supposed to be checking in already and here we were still sitting on a train. We had to get off at Trastevere and take another train, but luckily this time we immediately knew which one to take. Our flight's check in closed at 18:10 and we got there at 17:50, I was nearly in tears as I didn't know how the heck we made it. I was sure that we would miss our flight (because of my Sephora shopping and busses that weren't on schedule) and how was I going to afford another plane ticket?! I was so so so relieved! We flew the two hours from Rome to Frankfurt and I made a bee-line for the duty-free shop so that I could purchase my Urban Decay Naked Heat palette (you can read about it here). We then flew overnight from Frankfurt to Johannesburg, and I must say, it was incredibly uncomfortable. We booked seats on the middle section (four seats next to each other with an isle on each side), but there were no seats in front of us and I actually think the leg room was less than usual. The tray tables were also small and uncomfortable due to the fact that they fold up into your armrest, so yes, not doing that again. All in all I was very happy to be back on familiar ground and I looked forward to going home and kissing my dog. That was it for my Italian travel series! I hoped that you enjoyed it, please let me know if you have any questions or comments. I could do another post with "tips and tricks" for going to Italy, or, just planning a European holiday. Let me know!